Implementing a new content marketing strategy may make you feel like you’re Sisyphus, pushing a rock up a hill and getting crushed as it rolls back down. The rock is your strategy. The hill is your fight for recognition of that strategy. Without getting buy-in from stakeholders at the forefront of developing your strategy and maintaining buy-in throughout its execution, you’ll have a nearly impossible time trying to keep pushing that rock. Support: With stakeholder support comes the freeing up of resources and he or she will help remove roadblocks in your way. Focus: This ability to have clarity and space gives you and your team the room necessary to execute your strategy. Success: That shared success of achieving the goal and getting the rock over the hill together not only feels good, it’s good business. The more people you have working with you, helping to push that rock up that hill, the less resistance you’ll face. According to the Content Marketing Institute, 24 percent of content marketers cite the lack of buy-in as the primary challenge they face. Here are 10 ways to get stakeholder buy-in on your content marketing strategy. Who needs to sign off on resources, people or money? Who will be directly affected by the implementation of the strategy? Who needs to do or provide something required by the strategy? Who will be fighting for the same resources, people and funds? Who could derail, or even outright kill, the project? All of these people on your list are your stakeholders. Arm yourself with an understanding of who you need to turn into an advocate. No matter how high up you are on the chain of command, you need to get in front of them before implementing your strategy. Otherwise you risk going it solo and becoming a rogue agent. Mind Tools has a great interactive screen app for identifying and prioritizing stakeholders based on their power in the company and their interest in the project. Capture stakeholder information before you finalize your strategy. Even if you already have a clear vision of what you want to do, this is not the time to pitch it. Communicating your ideas by asking someone for their input generally goes further than simply telling someone what you want to do. Instead of working top-down or bottom-up, start by going middle out and getting buy-in from your peers closest to you on the org chart. Then expand outward from there. This method will also reduce the perception that you’re doing end runs and working around people. Next, have some quick chats and grab coffee, lunch or a drink. The meetings don’t need to be formal — keep the conversation low pressure and hypothetical. Make clear that at this stage, you’re not asking anyone to actually do anything. What’s the goal of doing this work? What results will that provide? How will they [the stakeholder] benefit? 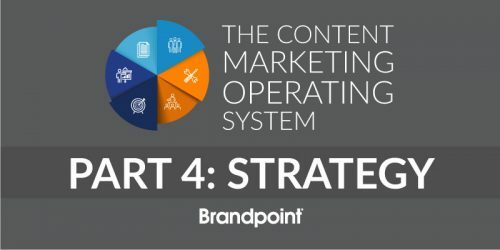 One of the most important questions to ask is: “Is our organization properly structured and ready to truly commit to implementing and supporting a content marketing strategy?” Like any major business initiative, if the answer is any form of “No, we cannot all get behind it,” then the odds of it succeeding are about the same as Han Solo making it through the asteroid field — 3,720 to one. To validate that you’re on the right track, provide analogous examples of other companies’ marketing strategy successes. This will provide a sneak peek into the potential future success of your company. Also, present numbers and tell the story of what the numbers represent, and how your company will benefit. About 80 percent of decisions are emotional, not analytical, so you need to paint a complete picture and make the case for your strategy. Utilizing both these approaches helps analytical and emotional stakeholders understand what you’re looking to accomplish. The next step is to share your vision with small teams. It’s OK to communicate this even if the strategy is incomplete because you’re still continuing to get input. The simple act of practicing and refining the pitch is all part of the strategy development itself. If time is of the essence, then start building a sense of urgency by addressing what the risk is if this strategy is NOT implemented. Why: Why is this important? Why is it worth investing in? How: How will the strategy be executed? How will resources, people and money be applied? What: What are the objectives? What exactly will be delivered? What do you expect the results will be? Who: Who will benefit? Who is the audience, internally and externally? Where: Where will this work end up — which platforms or media channels? When: When does the work need to be started? When will it be in the field? When will the work be completed? These are the components that should be addressed in your strategy. By solidifying these details, you’ve covered most of the work needed to document your strategy. Capture all that you’ve learned and put it into your content marketing strategy. Documenting the strategy makes it “real.” It becomes a touchstone to guide the implementation, manage expectations and reassure all stakeholders that you’re on the right path. We like to provide a top-down view of our strategies, starting with the big picture and then working down into the details of the tactics. Here’s the structure we’ve found best encapsulates the entirety of the strategy: Vision (Overview), Audience (Who Benefits), Goal (Success Metric), Strategic Approach, Objectives (KPIs), Tactics (Deliverables), Resources Required, Milestones (Timing). Not everyone will be on board at this point. The key ingredient in achieving understanding and acceptance is repetition. We’ve found it’s important to heed the seven times rule prescribed by EOS. You might get sick of talking about your strategy, but people often have to “hear something seven times before you hear it for the first time.” Until your stakeholders have that critical “aha” moment, they need to keep hearing the message. Nothing gets buy-in like proving that there’s substance behind your strategy. The best way to win is to “Think Big. Start Small. Move Fast,” which was first pioneered by experts at the Mayo Clinic Center for Innovation. To get the last of your stakeholders on board, provide a proof of concept or run a test to demonstrate an early win. Hard results beget confidence! Build support by broadcasting positive data at your earliest convenience. Once you have your buy-in, the work doesn’t stop there. You’ve set expectations with everyone, and now you need to follow through. This is where maintaining the buy-in becomes critical. We’ve learned from experience that you’ll need to communicate more than you think you should to keep stakeholders in the loop during all steps of the project’s life cycle. Regular level setting is how you will stay on top of managing expectations should any questions or concerns arise. To be successful, you have to provide transparency throughout the process and visibility into what is being done from day to day. Establish a regular cadence of checking in, in person and online. Use a tool to keep stakeholders involved in the progress of your strategy. BrandpointHUB is a cloud-based content marketing platform that features an editorial calendar that displays all your content projects. Stakeholders are able to access and monitor the latest updates and results at any time, from anywhere. They can also provide feedback and approvals right in the platform, making transparency and stakeholder buy-in easier for everyone.